This was a first for me . . . witnessing a down and dirty fight between American Coots intent on keeping each other off coveted turf. Neither bird was hurt. Well, maybe emotionally. The loser scrambled across the water to escape the victor. 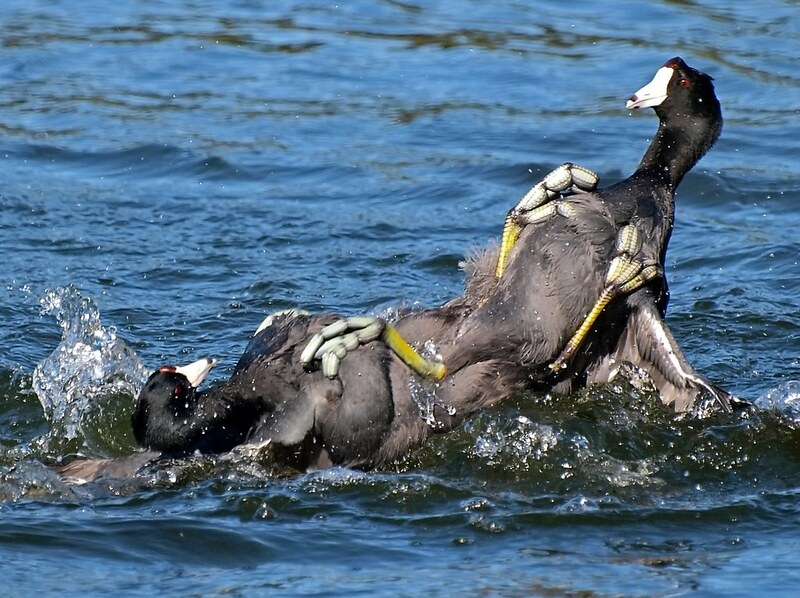 American Coots can drown in territorial battles, although it’s not common. They pound each other with their huge, feet (and those lobed toes) and sometimes one coot is held under water in the process. Amazing shot! I just learned something new too, thanks for sharing. Ingrid, that’s an amazing photo! I love coots – cute little water chickens. Their feistiness, though, is legendary. I participated in duck banding for the first time last summer, and a friend warned me that a joke the veterans sometimes play on newbies is putting a coot in the crate. Unlike ducks, coots will peck and claw like crazy. Holly, thanks for the kind comment — and for stopping by. Yep, you’re right, those coots are known for their — well –coot-like behavior. I love them, too — and water chicken is a great designation. The different personalities of various water birds makes working with them interesting. We had to tube-hydrate grebes and murres during a wildlife incident last year, and the disparity between, say, a Western Grebe and a Common Murre (running around like a little penguin) is fascinating to observe firsthand. I found this bit posted in the IBRRC blog (the primary aquatic-bird response center here in the Bay Area). The volunteer talks about the stunt a little coot pulled before bath time: http://bit.ly/aBKrBk. Thought maybe you could relate.